Before the world's last woolly mammoth took its final breath, the iconic animals had already suffered from a considerable loss of genetic diversity. These findings were made in the first ever publication of the full DNA sequence of the extinct animal by an international team of scientists from Stockholm University, the Swedish Museum of Natural History and Harvard Medical School among others. These findings, based on a comparison of the first complete genome sequences isolated from two ancient mammoth specimens, are reported in the Cell Press journal Current Biology on 23 April 2015. One of those mammoths, representing the last population on Russia's Wrangel Island, is estimated to have lived about 4,300 years ago. The other specimen, from northeastern Siberia, is about 44,800 years old. The younger of the two specimens showed much lower genetic variation, including large stretches of DNA with no variation at all ‒ the mark of living in a small population in which related individuals unavoidably mate with each other. 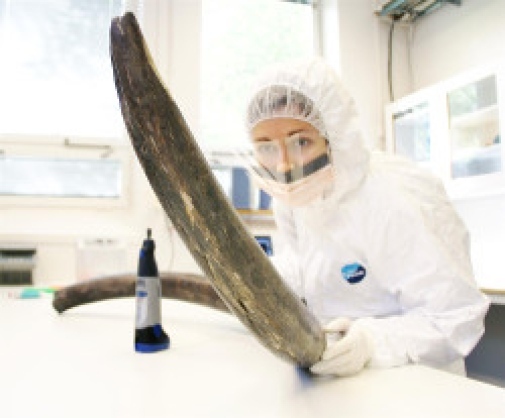 “We found that the genome from one of the world's last mammoths displayed low genetic variation and a signature consistent with inbreeding, likely due to the small number of mammoths that managed to survive on Wrangel Island during the last 5,000 years of the species’ existence”, says Love Dalén of the Swedish Museum of Natural History. Sequencing ancient genomes is no easy feat, explain Love Dalén, and Eleftheria Palkopoulou, a PhD in Paleogenetics at Stockholm University and the Museum of Natural History. In most cases, the DNA is damaged, highly fragmented, and contaminated by DNA from microbes and sediments. After considerable screening, the researchers managed to find two samples with exceptionally well-preserved mammoth DNA. Because an individual’s genome is a mosaic of bits and pieces of DNA inherited from a large number of its ancestors, a single genome contains a vast amount of information about a species’ population history. Taking advantage of this, the researchers inferred that woolly mammoth populations suffered a blow in the Middle or Early Pleistocene, some 250,000 to 300,000 years ago, for reasons that aren't clear. Ancient and temporary loss in numbers was followed by a more severe decline at the end of the last glaciation, from which the woolly mammoth never recovered. “Only by generating high-quality genomes could we discover population-size changes far back in time, revealing two significant population crashes in the mammoth’s history,” Dr. Palkopoulou says. The study is a result of an international collaboration involving researchers from Sweden, the United States, Canada, and Russia. The researchers plan to continue sequencing genomes representing different times in order to further investigate the woolly mammoth’s evolutionary history. “Sequencing the genomes from extinct animals will not only help us better understand the biology and history of these species, but can also provide important information on how and why species become extinct in general,” Dr. Dalén says.